Nick Clegg’s visit earlier this week to the constituency of Maidstone & the Weald, on account of it being one his party’s “top targets”, led me to wonder whether the Lib Dem leader hasn’t become a little demob happy. It also prompted me to dig out the list of what would, in a parallel universe, be the 20 seats most likely to fall to the Lib Dems at the election. I’m quite confident that the party will not win a single one of these constituencies. Neither will it win Maidstone & the Weald. What was Nick Clegg even doing there? 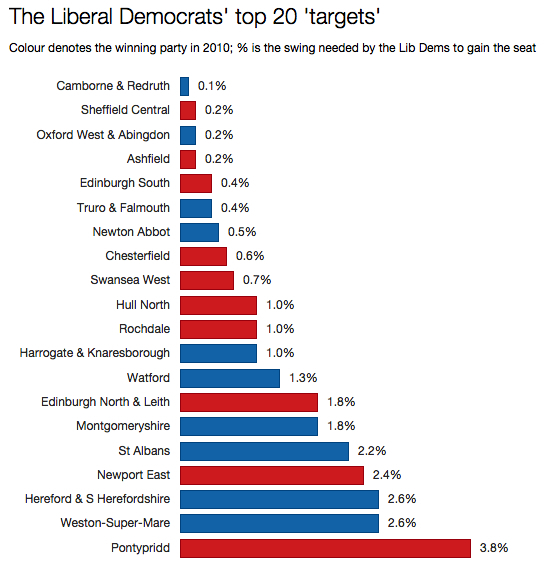 Yes, it was a stunt that won a few headlines, but the Lib Dems need a swing of 6% to take the seat. Even the “private polling” that Clegg cited as grounds for optimism showed his party four points behind the Tories. I’d have thought his time and energy would be best spent campaigning alongside candidates in seats the party is defending, not making surprise forays into places in which he doesn’t stand a chance. But maybe he has been gripped by a bit of end-of-term dizziness. Either that or he thinks it’s 2010 all over again. This list shows how close LDs came in 2010 to having perhaps 80 seats instead of their 57 as other party’s lead so small. I agree they will gain no seats in 2015 but keep an eye on Watford as mayor is their candidate and Montgomeryshire a traditional Liberal seat. They will wish to maintain a respectable voteshare in most of these seats with a view to perhaps gaining in the following general election which could be much earlier than in 2020. I’ve seen a lot of Lib Dem posters up in Maidstone & the Weald, next door to my constituency of Faversham & Mid-Kent. There are a lot of seats where the Lib Dems will have to at least make some noise to remind people they exist, to help mount a strong challenge in 2020. Yep – the LDs have to play the long game here – they have to stay second in some seats where they are currently second in order to have a chance to be first in such seats next time round… unless we miraculously have PR by 2020!! Compiling this list must be the definition of a slow news day! I agree Clegg seems demob happy – it’s actually quite refreshing to see him so upbeat after a miserable few years. He either expects not to have a seat after 7 May or not be party leader or both. To be honest he has been pretty upbeat throughout the last five years. Especially since he was mocked so widely for his apology on tuition fees, he’s realised that dwelling on your mistakes and bemoaning your fate is not an effective way of doing politics. The only time I’ve seen him publicly disappointed since then was in the aftermath of the European elections.